Psoriasis is a chronic skin condition marked by raised, scaly skin patches called plaques. Itching, burning, or stinging sensation usually accompany these plaques. Psoriasis occurs in cycles, with each flare lasting weeks or months. Psoriasis of the elbow and forearm. 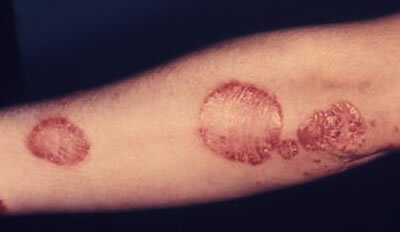 Psoriatic dermatitis patches on the forearm. Most people with psoriasis only get a few plaques on the elbows or knees. However, in rare, serious cases, the plaques and pimple-like pustules can cover the entire body. 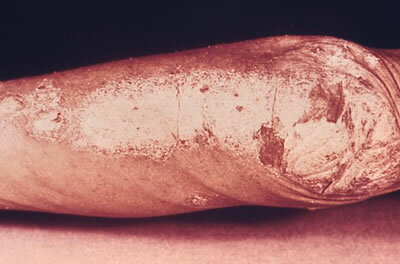 Psoriasis found in the abdomen. In about 5% of the patients, in a condition called arthritic psoriasis, arthritis will develop in the joints after the plaque formation. Who Gets Psoriasis and How Common is it? Psoriasis occurs most often in adolescents and young adults - however, it can occur at any age. It is thought to be an inherited condition - if either parent has it, then it is likely that the children would have it as well. 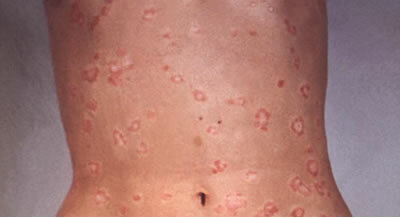 It is a very common condition - it is estimated that over 6.4 million people in the United States have psoriasis. The exact cause of psoriasis is not known. Flares can be trigerred by infection, stress, changes in temperature or climate, skin injury, and alcohol intake. It can also be trigerred by prescribed medicines, such as lithium and anti-malarial drugs. In summary, in psoriatic skin, skin cells reproduce about 10x faster and exist in a far higher density than in normal skin. This results in skin thickening and plaque formation associated with psoriasis. Plaques can form following cuts and scratches on the skin. In this treatment, the skin is exposed to ultraviolet A (UVA) light. Sometimes, a medication called psoralen that sensitizes the skin to uv light is prescribed. This treatment, called PUVA (for psoralen Ultraviolet A), is given several times a week at the doctor's office. There is no cure for psoriasis. However, the treatment above can help clear up the plaques and alleviate the symptoms of this condition.